The stock market has been in a holding pattern for a little over a month, and it's still down "slightly" from that peak made in the third week of May. It is somewhat amazing to me to see some of our indicators, which I noted on Monday, showing deep pessimism. But remember overall that our Asset Allocation Model is showing Psychology walking a tight rope between P3 and P4, which is pretty close to the middle of the road, while Monetary and Valuation are extremely bullish. So, if you are sitting there stewing about the Fed this morning, take a look at the chart below, which virtually guarantees that our Monetary Composite is not even close (in time or amplitude) to creating any bearish tendencies for stocks. The Fed is committed to creating maximum economic activity, while inflation remains moderate. So how does this hit you? 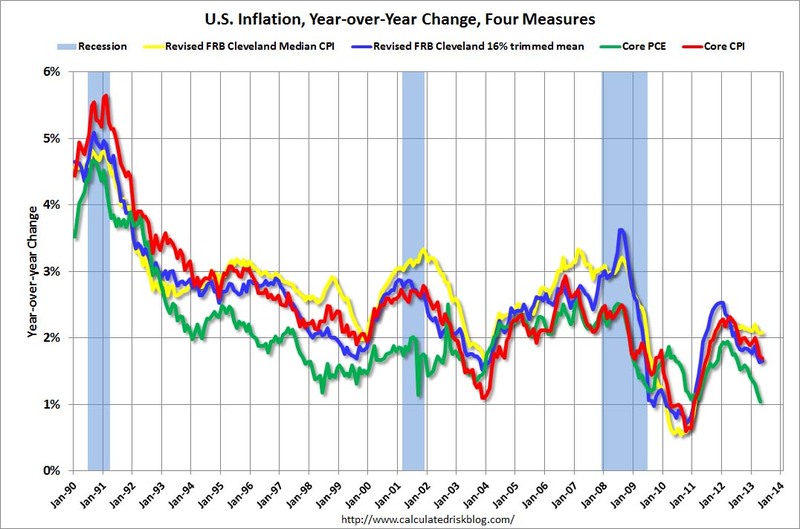 Remember, the green line in the chart above is the Fed's favorite inflation gauge. It is at 1% and falling. So you can listen all you want to the "jabberwocky" about what the Fed's Open Mouth Committee is spouting, the Fed is going to continue to make sure that they keep the pedal to the medal.